FLASHMOB #18 HAS BEEN POSTPONED DUE TO BAD WEATHER. Stay tuned for further dates! Yeah, not much of an ‘activity’ as such, but it will be important that we all know what’s going on and coordinate ourselves for the other activities. Disperse loosley around the pigs. A group of girls will run up to a Target screaming like they’ve seen [insert your favourite celebrity here] and asking them for autographs. Everyone else is to then rush in with cameras blazing. 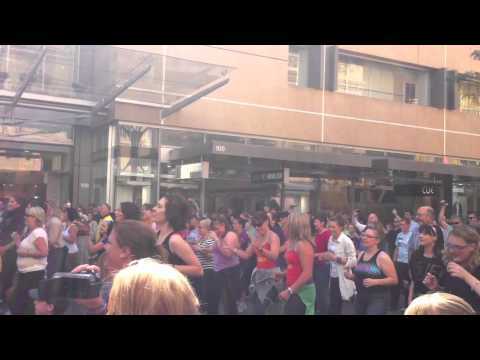 After about 10 or so seconds, let the person pass through the mob and disperse, heading to the next locations (Gawler Place canopy and then Mall’s Balls). Hopefully we’ll get some great photos, but also cause a bit of a scene! We will gather at the side street, and as a group, we will gradually swap a Target. Once we’re all around the person, Ben will shout ‘look out’ and we will all drop to the ground IMMEDIATELY. Count to 5, then get up and disperse in all directions like nothing happened. Head back to the side street to start again. We will do this a number of times. We’ll decide to keep going or not back at the side street. Someone will come along and start throwing bread on the ground saying ‘here chicky chick!’ after they’ve put a good number of handfuls, swarm in, clucking like chickens. Make plenty of noise, cluck at each other. A whistle will sound and everyone is to stop being a chicken and disperse quietly, heading off to City Cross for food!